There were fewer straggling polls that surfaced either late Friday or over the weekend as compared to the week before. [FHQ wasn't around to deal with them anyway.] 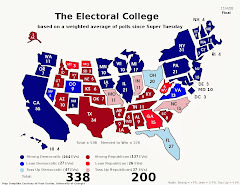 Those that were released were of little consequence to the outlook on the electoral college. Now, FHQ said that what changes there were based on the newest collection of polls were not all that consequential, and while that is true on some level, it is not completely so. The latest Rasmussen survey of Indiana showed a slight growth in Mitt Romney's share of support, but a bottoming out of Obama's rate of response in the Hoosier state. The president's loss was offset by a fairly large and nearly equivalent increase in the percent undecided in this poll relative to the May Rasmussen poll. What that left was a +16 Romney advantage in Indiana. However, for a barely blue state in the 2008 election, that is a larger swing back toward the red than has been witnessed elsewhere in 2012. Does that mean that this one is an outlier? Well, the poll did send the FHQ weighted average on Indiana into Strong Romney, but it was also only the third survey that has been in the field there in 2012. We should, then, expect some volatility albeit perhaps not this much. What is clear for both Indiana and South Dakota below is that these Lean or Strong distinctions are of little import. Neither is at all likely to slip into the president's column now or any time between now and election day. If either is blue on November 6, then the president will have been re-elected. See Indiana. Volatility, very sporadic polling, red state. And yes, red despite the shift toward Obama in this instance. Nielson Brothers is the only polling outlet that has surveyed the Mount Rushmore state. We see there almost the exact opposite of what happened in Indiana, though. The number of undecided respondents shrunk compared to a February poll and while both candidates' shares grew, Obama was the greater beneficiary -- nearly 2:1 -- over that time span. Again, this may have triggered a category shift, but South Dakota will be red in November. Cast in binary terms, both Indiana and South Dakota didn't budge and won't. Survey USA was in the field in Washington state just a couple of weeks ago and things have not changed all that much. 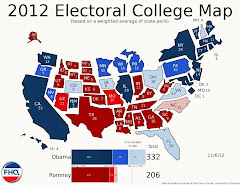 Romney has held pat at 37% and Obama shifted from his lowest point in the polling of the Evergreen state to what had been his high water mark in the eight previous surveys. That is not an insignificant change, but one that is well within the range of polling data for each candidate in polling of the state. All told this round of polling pushed Indiana into a safer position from the Romney campaign perspective. Meanwhile the gap between president and his Republican challenger in South Dakota contracted, but can hardly be considered tenuous for Romney. The changes are a function of the amount of polling in each and are not indicative of any major shift in the race. Both states are red and very likely to stay that way. 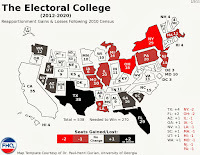 But both change categories; Indiana dipping deeper into the heart of the Romney side of the Electoral College Spectrum ledger and South Dakota jumping all the way to the middle column. Washington, on the other hand, switches places with Minnesota on the Spectrum and goes off the Watch List into the Strong Obama category in the process. 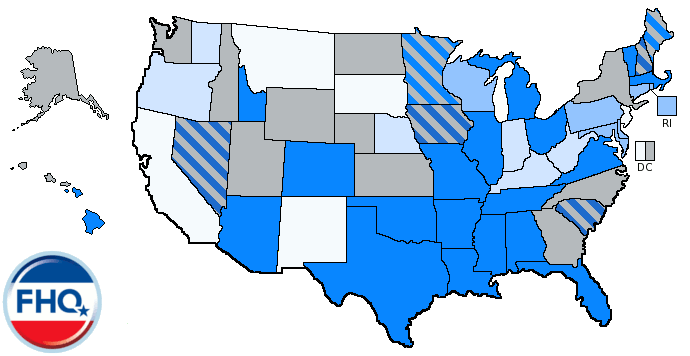 There has been some movement on and off the List of late, but the states most worth watching are the same states that have been worth watching: those in light blue. As we head into the fall campaign, the question remains whether those states stay where they are or drift over toward Romney either en masse or in some other combination. EDIT: There was also a new poll out of Virginia that showed the president up four points on Romney (44-40). There was, however, not enough information from Gravis Marketing (i.e. : sample size, dates, etc.) to include it in the weighted average in the Old Dominion.